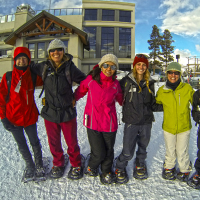 Travel by snowshoes on an educational tour through the forests atop Vail Mountain. Learn about winter ecology and animal adaptations as you gaze at majestic mountain views. Please come prepared to spend an hour outside in the winter environment with snow pants, warm hats, gloves and sturdy boots. Snowshoes are provided. Online registration is required, visit www.walkingmountains.org/vailsnowshoe to register. Daily 2pm-3pm for ages 10+.